I would love to see the detailed results of this study. In particular, I would like to know how many people were anosmic to each chemical. 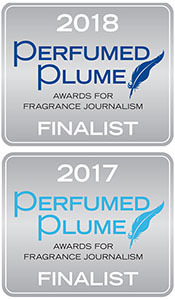 Having been spent a good deal of time on the fragrance blogs for the last year or so, I am constantly intrigued by how differently people will smell a particular perfume. One person may get a whopping big note of, say, violets or clove or rose, while another person doesn’t even detect that note at all. Considering that the commenters on these blogs are generally people who love perfume and are experienced at smelling it and know the vocabulary to describe it, these differences do certainly suggest that we are not all smelling things the same way. Yes, some more detailed studies that I’ve discussed in past posts have shown that not only do people have different anosmias, but they also have different levels of sensitivity to various chemicals and that makes some notes stand out more to them. It’s not possible to balance a perfume so that everyone will experience it exactly the same way. When bloggers review perfumes it can give people a general idea how they smell, but people really need to try scents for themselves to be sure how the fragrances will work for them. Sometimes you can find people who have similar noses, at least on many counts, and that can be helpful. You are right that even in the perfume community where everyone has the vocabulary, people smell things very differently and it’s not all just because of personal preferences, it involves perceptual differences too. Fascinating! I found this interesting too (and blogged about it yesterday). I do think she failed to point out that the smells most people encounter are complex combinations of molecules, not single molecules at a time, which is why people don’t realize they have selective anosmias! I also think it’s fair to say that a) this applies to the other senses as well and b) you can “learn” to smell things (Luca Turin wrote somewhere that a certain woody amber was barely perceptible to him at first and now he finds it nearly overwhelming). Yes, she seemed new to fragrance and her study was not as detailed as some of the ones I’ve read about by people who have more experience with this kind of research. I’ve heard some people say they could learn to smell a musk by diluting it (rather than sniffing neat) and then spending time with it gradually, or by soaking a scent strip with it and putting it in a covered container for a few hours and then sniffing the air in the container. But some people try all kinds of things and still can’t get more than a brief whiff of powder. If someone is missing the scent receptor for a chemical, it would seem mean to tell the person he/she could sniff the chem just given enough effort (which is certainly not what you’re saying!). It’s probably always worth trying as long as it’s fun — I think sometimes things may come into focus with more time or effort and sometimes not. That’s an interesting phenomenon though and I’d love to understand it. I remember reading how one well-known perfumer said he was anosmic to a certain musk but could still tell its impact on a scent blend, so that’s another interesting aspect when you’re dealing with chems in a blend rather than in isolation. In the symposium about the Rockefeller University study, Leslie Vossall compared having nonfunctional odor receptors to being color blind but with much more subtle results since there are so many more odor receptors than color receptors, which means that losing a few makes less impact on your life for smells than for colors. Whoops, yes, didn’t mean to imply that everyone could learn to smell everything — I know anosmia can be permanent/real. But I think sometimes, we are effectively blind/deaf/anosmic to something because we don’t know how to pay attention to it. I know musicians hear much more in a song than I do. When I briefly played French horn as an adolescent, I heard horns in everything, for example. I love the idea of sniffing a musk “neat”! Yes, I knew that’s what you meant, and it’s really true. Sometimes people take a quick sniff of something and then dismiss it, and are surprised to like it later when they have more time to spend on it. And the deeper we get into any field, including scent, the more we appreciate things we missed before. That’s part of what makes the journey fun. It’s good to let people know not to give up too fast if they can’t smell something right from the start. It’s also good to let them know they are normal if there are some things they can’t smell no matter how hard they try. Both those things are new concepts to many people. Absolutely! It’s good to hear a perfumer’s perspective on the matter. Laurie: I always enjoy your essays on scent perception. They are very interesting indeed, esp. as I am anosmic to all those pesky musks. But my nose is also changing, esp. this past year, so I smell things differently. It’s nice to re-smell things now. Regarding your querey about Japan and roses, it makes me think about the Shiseido fragrances. There were/are a lot of serious rose fragrances in their line – White Rose, Rosarium, etc. I’m all for lots of people loving Velvet Rose! Hi AnnS! That’s true, our noses and tastes change over time so it’s always worth re-sniffing something down the line. 🙂 And yes, I was thinking the same thing about the Shiseido rose scents! I’m not familiar with the fragrance market in Japan, but maybe someone who is will chime in. I used to think differences in smell perception of a perfume was how it reacted on our skin or an individual’s skin microbiome. After reading this, it just occurred to me that it’s our noses’ smell receptors that are responsible for the difference. A “duh” moment. Perfume does smell a bit different on different people’s skin, but the nose comes into the equation too. It’s quite interesting!